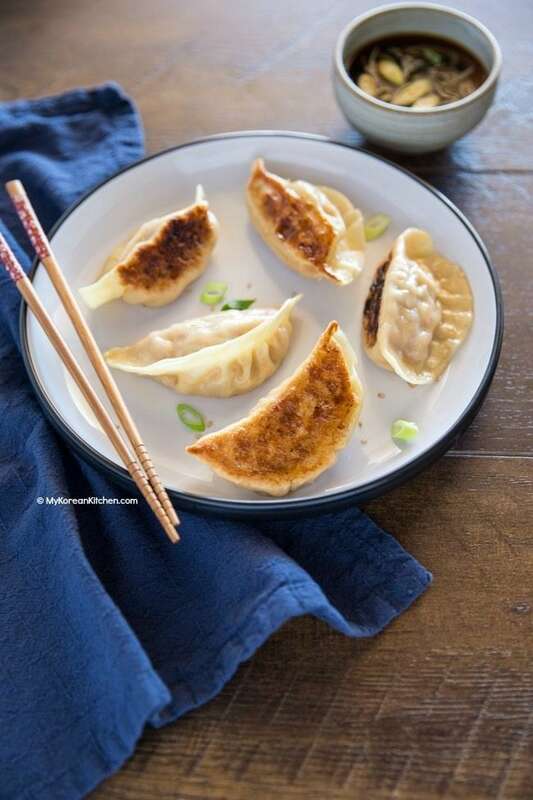 Easy and delicious Korean Kimchi Mandu (Kimchi dumplings) recipe. Let’s take a bite! 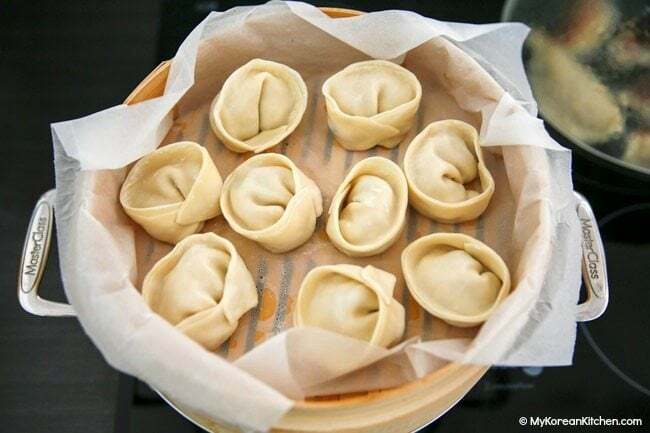 If there is Jiaozi in China and Gyoza in Japan, we have something similar called Mandu / Mandoo (만두) in Korea. As you can gather, one of the main dumpling fillings here is (napa cabbage) Kimchi. Typically, it’s also packed with minced pork and tofu as well. But these can be easily adapted to your preference. Mandu can be fried for a crunchy texture (i.e. gun mandu, 군만두 / yaki mandu, 야끼만두) or steamed (i.e. 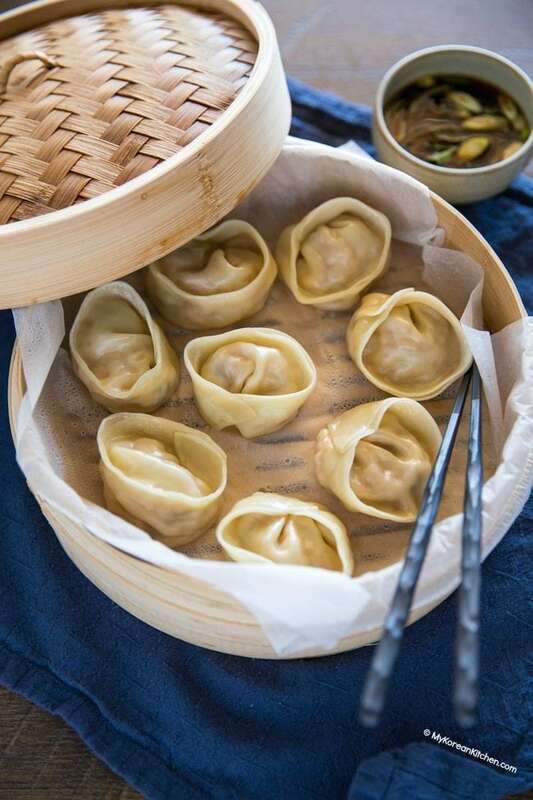 jjin mandu, 찐만두) for a healthier taste. Koreans also often eat mandu on New Year’s day – Typically in a soup (often with rice cakes). Though, I think I prefer my mandu in a pan fried form for the crunchy texture. It’s even tastier when it’s coated with Korean sweet and spicy sauce. 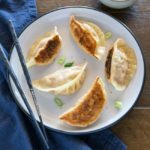 Considering how easy it is to buy instant / ready to eat / frozen mandu from a grocery store, it requires some effort to make mandu / dumplings at home. But, homemade mandu tastes genuine! You know what I’m talking about, right? Also, Kimchi mandu is another great way to use up some of your ageing Kimchi. 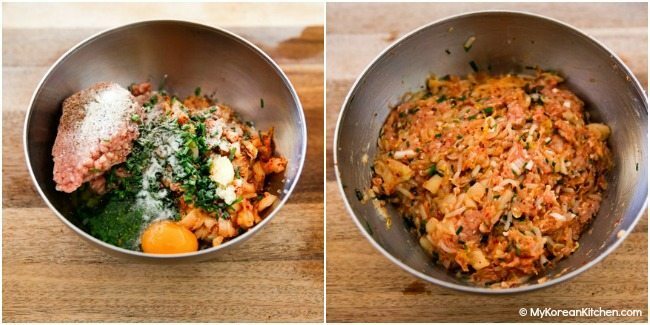 (Check here if you’re looking for more recipes with Kimchi! Anyway, I hope you try my Kimchi mandu recipe soon! P.S. 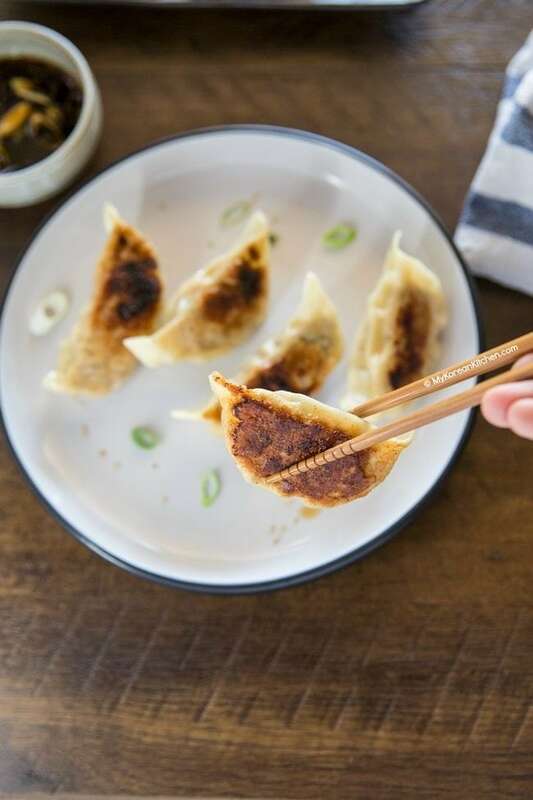 Don’t forget to serve your mandu with my epic dumpling dipping sauce! They are the best combination! 3. Repeat step 2 until you use up the remaining ingredients. 4. Cook mandu per your preference. In a well heated pan, add some cooking oil. Place some mandu and cook over medium high heat until the bottom of the mandu is golden brown (2 to 3 mins). Reduce the heat to medium to medium low. Add the water (1/4 cup) and put the lid on to cook with the steam. This will ensure the meat is thoroughly cooked without burning. 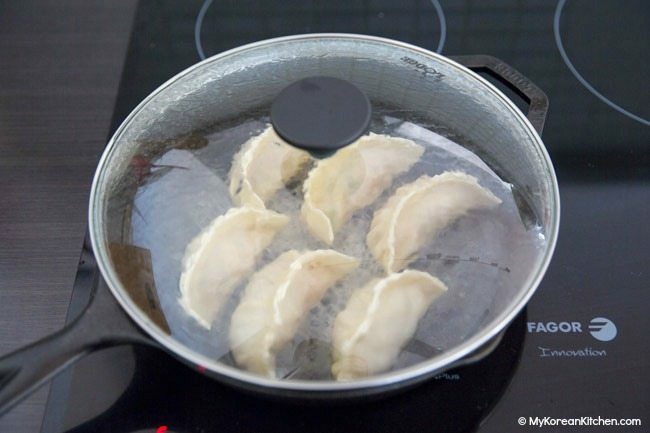 Your mandu should be ready to eat when most of the water disappears in the pan (in about 5 mins). Place some non-stick materials (e.g. 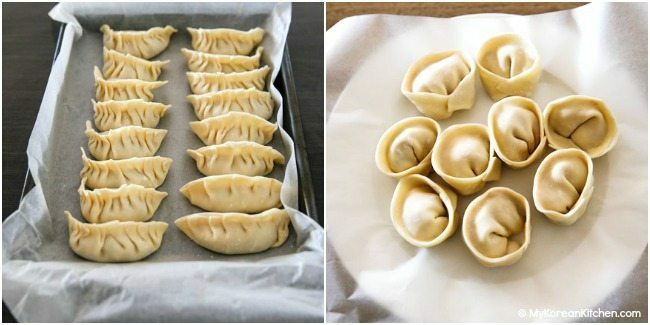 cabbage leaves or baking paper) on a steamer and place the mandu in it. Make sure the mandu are not touching each other. Put the lid on. Place the steamer over rolling boiling water (in a sauce pan) and cook the mandu for 15 to 20 minutes on medium low heat. 5. 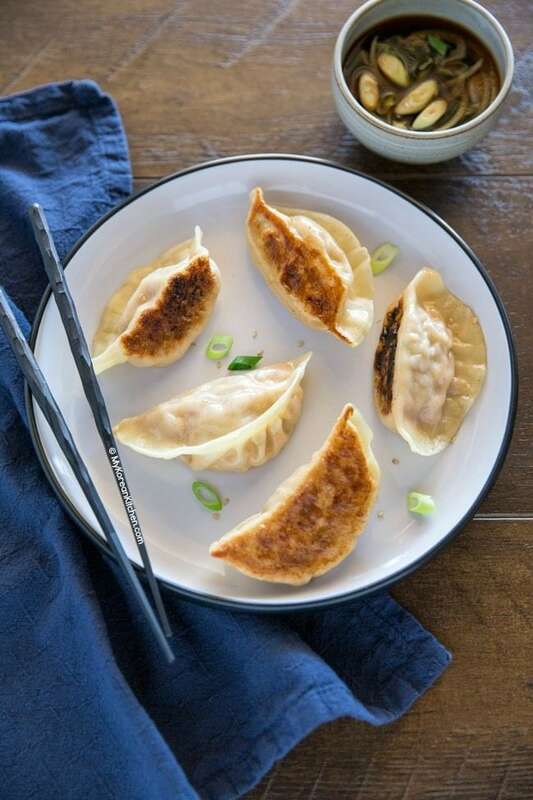 Serve the mandu on a plate while still hot and with Korean dumpling sauce. Kimchi, tofu and mung bean sprouts naturally contain lots of water. Excess water should be removed from these ingredients. Otherwise, it can tear the dumpling wrappers while you’re still assembling. I typically use this type of cotton cheese cloth but this type of muslin bag can be convenient to use as well. Reminder – Kimchi can stain these cloths. If you don’t like using tofu, you can add more pork / beef instead. Likewise, if you want a vegetarian version, you can add more tofu instead of using pork / beef. Repeat step 2 until you use up the remaining ingredients. Cook mandu per your preference. 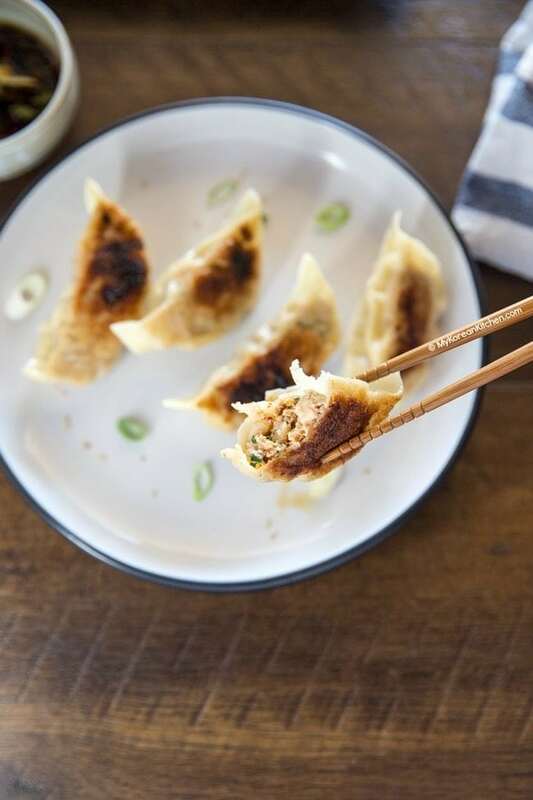 Serve the mandu on a plate while still hot and with Korean dumpling sauce. **Kimchi, tofu and mung bean sprouts naturally contain lots of water. Excess water should be removed from these ingredients. Otherwise, it can tear the dumpling wrappers while you’re still assembling. I typically use this type of cotton cheese cloth but this type of muslin bag can be convenient to use as well. Reminder – Kimchi can stain these cloths. ***If you don’t like using tofu, you can add more pork / beef instead. Likewise, if you want a vegetarian version, you can add more tofu instead of using pork / beef. I spent many pleasant hours wlking the streets of (please any spelling errors) Song Tan and Kun San with a bottle of local beer and a bag of yaki mandu from a street vendor covered with red sauce. Though away from loved ones I enjoyed my off time when on temporary duty in the USAF. I also love bulgogi and kimchi (the spicier the better). I even liked the slightly sweet dried fish in sort of thin patties. Of course I consumed soju and Oscar – grape is the best. I was always impressed with the industriousness of the Korean people. Had I not already been married, I would likely have marriso fitting.ed one of the beautiful women the place seemed seemed to be overflowing with. “Land of the morning calm” So right. The recipe is great. May I know do you have any re iOS to make homemade Mandu wrapper? I’m sorry for the typing error. It’s recipe instead of reiOS. Hi Cindy, I do have the recipe for mandu wrapper, but it hasn’t been tested for a long time. I will share it once I test it again soon. Stay tuned! So good! Made these without tofu and the bean sprouts. Solely used beef. I pan fried and added water to steam as directed. I had the square wrappers, so it took me a little bit to understand how to fold-thank you YouTube! Next time, I would like to try with bean sprouts, but for those not able to obtain, it still is amazing! Made these again! It is now a annual tradition. So good! Thanks for your instructions on freezing the dumplings Sue! My plan would be to make a double batch so I can freeze some for later – how would you recommend defrosting them/heating them? If you already followed the freezing instruction from above, you just need to steam them for about 5 mins before eating them. Hi Kathy, Dumplings can be soggy if the filling has too much water. It can tear the dumpling wrappers while you’re assembling. But, I can’t imagine slimy dumpling texture. Was it steamed? Hope they turn out well for you! Yeah, if you don’t like the steamed textured, pan fried is a way to go! Enjoy! This is fabulous. Love the filling combination and the dipping sauce even more. Need to figure out what aged Kimchi is though. But great idea for the holidays.